Similarly to collection artists Saskia Olde Wolbers or Ronnie van Hout, Jacqueline Ball constructs sculptures from cardboard, clay, wax, plaster, metal and paint which she then theatrically lights and photographs. This process is lengthy; Ball shoots and rearranges her models multiple times to achieve the desired formal tension. Once transformed into very large rag prints, Ball’s sculptural models become ambiguous. Her photographs tend to create a wall of rich texture, which in the case of ‘Fluctuate’ focuses on fleshy purple, pink and red tones. Ball conjures both a sense of bodily intimacy and foreign grandeur through the interplay of differing scales and surfaces. 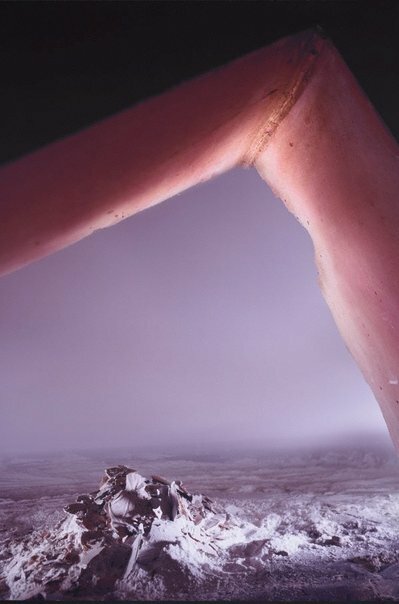 The models she fabricates and the resulting photographs are often geometric and abstract, yet she uses them to invoke ideas around organic growth and decay. Inspired by the work of collection artist Pat Brassington, Ball’s work produces a similar sense of disorientation through manipulation of forms and textures. It intrinsically points to the difficulty of perfectly clear, singular perception. In order to achieve the crisp, luscious print result visible in the ‘Fluctuate’ series, Ball stitches 3 images together, each of very high quality. This enables the level of detail and depth evident in the prints and is further enhanced by the artist’s insistence on the finest quality paper, Hahnemühle photo rag. ‘Fluctuate #6’ is of the scale of a domestic doorway, which enhances our corporeal experience of the work. In suggesting this movement inwards and outwards, the photograph also mimics a lens. These openings delineate other realities and momentarily allow the viewer access to them, before reminding us of their wholly constructed nature. Primavera 2013: young Australian Artists , Sydney, 2013, 22-29.